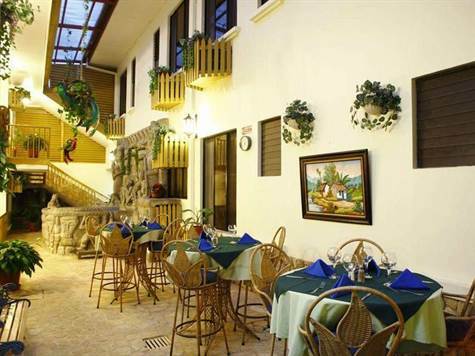 Thi Luxury City Hotel is conveniently located about ten minutes from the San Jose Juan Santamaria International Airport (SJO) and ten minutes from Central San Jose. It has has been most recently decorated in an interesting and relaxing Mayan jungle theme. The thirty four hotel rooms tend to be quite spacious and fully loaded, most with two new queen size beds, some with three, all with private baths, some with bidets, most with flat screen TVs, wireless internet access, A/C, direct dial phones with VoIP to make international calls, coffee makers, a small writing table and chairs, an attractive armoire closet and dresser, and an in-room safe. Included are three suites with one king-size bed (usually for honeymooners) that have an in-bath Jacuzzi, microwave, a small fridge and outdoor balcony overlooking the up-scale Los Arcos neighbourhood and distant Escazu mountains. This Hotel is an excellent opportunity for investors or perhaps a mature family wanting to make that quantum leap but earn money from day one. It is fully operational, has all the required licences and basically runs itself with the management I have in place, including my son Mike as the general manager. Unlike seasonal beach and mountain properties. It tends to be busy year round. Many Floridians and Texans fly to Costa Rica to escape the heat, while vacation property owners and Latinos enjoy traveling in the off-season. Plus it is # 1 on TripAdvisor as a business hotel, being in the free-trade zone. Call me for more detail.